Ha! 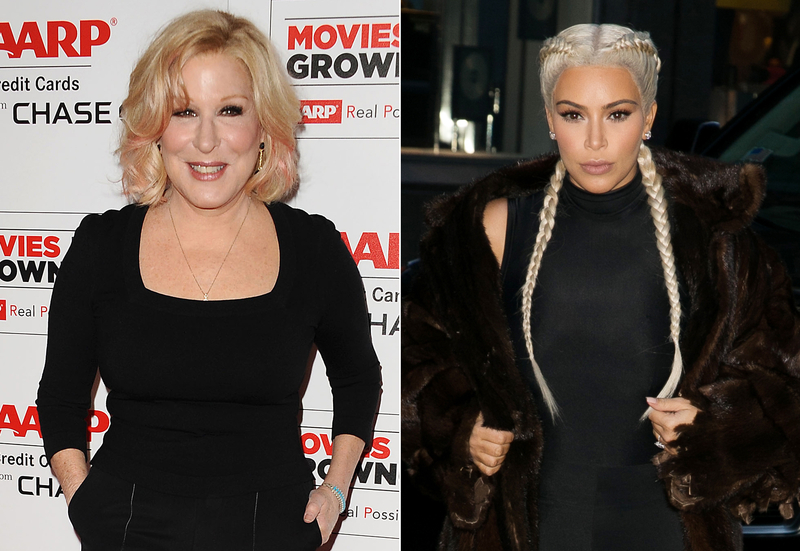 Bette Midler is clapping back at Kim Kardashian — but for a good cause. On Wednesday, March 9, the funnywoman finally responded to Kardashian’s “send nudes” tweet and teased the reality star about doing good with her naked selfies. On Wednesday, Midler decided to use the drama to her advantage. “. @KimKardashian wants me to send her my nudes! I&apos;ll send them right over but the lighting&apos;s bad right now since she threw all that shade!” she tweeted, sending her followers into hysterics, before encouraging the 35-year-old reality star and others to donate to her charity. “. @KimKardashian Put your selfie to work…for a good cause! Donate, RT, I&apos;ll match $$ 2-1! http://tinyurl.com/S4S-2016,” she added alongside an artsy Photoshopped image of herself holding a piece of cardboard to cover her scantily clad body. Midler included a link to donate to her charity, Stages for Success, which is a campaign to modernize outdated and dysfunctional public school auditoriums for child singers and performers. Considering Kardashian already joked that she was too busy depositing millions of dollars to take time to address haters on Monday night, we’re assuming she’ll respond.